A while back, we showed you this awesome magnetic bottle opener for all your no-mess, Adult Beverage needs. 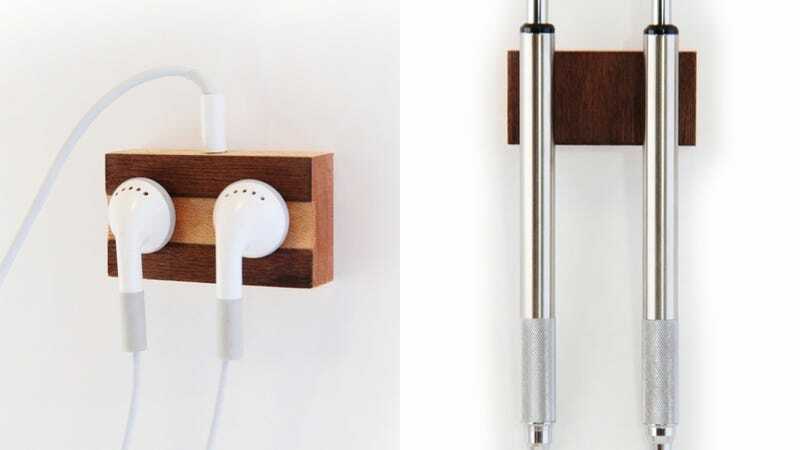 Now, our friends at DropCatch have infiltrated the office—not with beer (bummer) but with a new line of lovely magnetic pen and headphone holders. Both holders are handcrafted from maple and walnut wood, and can be applied using the accompanying adhesive-backed washers. That way, the holders will lie flush with whatever surface you stick 'em on. While you could stick any metal pen to the holder, DropCatch does provide you with a Zebra-designed pen and pencil, which is a nice little touch.